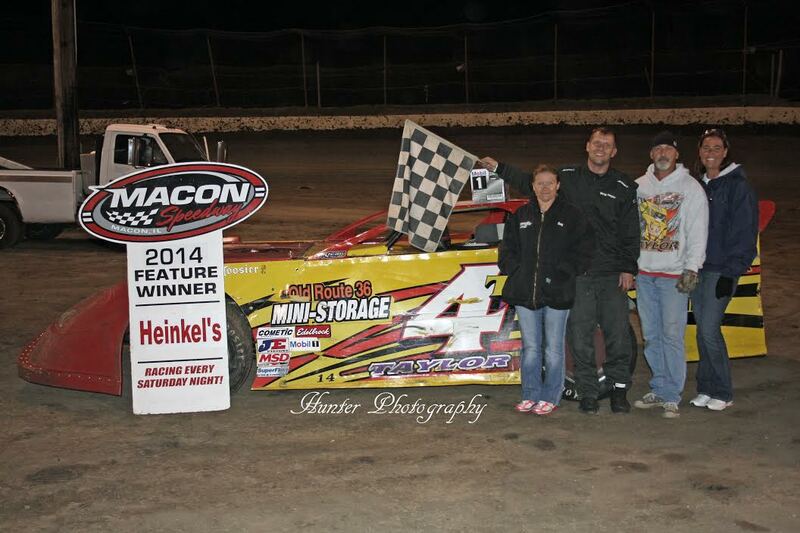 Guy Taylor won the first ever Pro Late Model Feature at Macon Speedway Saturday. MACON—The new class of Late Models arrived at Macon Speedway Saturday and was well-received. The Pro Late Model class, made up entirely of crate engine cars, made its debut with 15 cars and a heat race finish with side-by-side-by-side racing. The winner was a familiar face to victory lane, however, as Guy Taylor took the 25-lap feature win in the inaugural event. The Pro Late Models expect to be a regular weekly racing class in 2015. Nick Justice battled and fought off Terry Reed to claim the checkered flag in the Street Stock feature event. It was as difficult as could be for Justice and both Reed and Bobby Beiler challenged him for the top spot but Justice would not be denied on this night. Jeremy Nichols led all 15 laps as he won in the Sportsman division. Nick Macklin stuck close to Nichols and let him know he was around with a few bumps but Nichols pulled away in the end. Dave Crawley, Jr. was glued to the bottom of the track in the Billingsley Towing Modifieds feature. Tommy Sheppard, Jr. tried to use the top side but couldn’t make the groove work as well as the bottom did for Crawley. Sheppard would finish second. Danny Smith started 11th and took a third place finish. The 4-cylinder Hornet divisions were swept by the city of Bloomington as Thad Gee won in the Outlaw Hornet class and William Deavers took his first feature win in the Stock Hornets. The Illinois Lightning Sprint Series made another appearance at Macon Speedway and had quite a feature finish as Gedd Ross held off Austin Archdale in the fourth turn to secure the win in a back-and-forth final few laps. Over 100 racecars flooded the pits on a chilly night for racing which also saw a Heinkel’s Packing Company Hot Dog Eating Competition and Dana Damery from Rocco’s win the Bud Light Ladies Night Championship, presented by Y103. Bud Light Ladies Night – 1. Dana Damery (Rocco’s), 2. Jennifer Cramer (Rocco’s), 3. Dawn Reynolds (Starship Billiards), 4. Christine Vogel (Pop’s Place), 5. Holly Vinson (Starship Billiards), 6. Michelle Perry (Pop’s Place), 7. Laurel Phipps (Woody’s), 8. Brianna Livingston (Woody’s).